I am wild about this group of young women lawyers and law students and the success and visibility it has gained in a relatively short time. I support this group through my permission to reprint my blogs on the Ms. JD website, and I attend and contribute to many of the valuable programs that Ms. JD sponsors around the country. In the interest of full disclosure, I also was the recipient of the Ms. JD Sharing Her Passion Award at the 2015 Annual Conference in San Francisco. The picture is of me giving acceptance remarks at the awards ceremony. 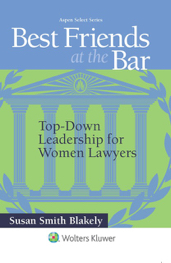 I am so proud to have Ms. JD recognize the value of the Best Friends at the Bar program to its members and all young women lawyers. I am also proud that my law school, Georgetown Law, was one of the schools that helped launch Ms. JD. Go Hoya Women Lawyers! So, hat’s off to Ms. JD and all the wonderful work it is doing here and across the globe with its new international programs. Read about it on the Ms. JD website. I was both amazed and inspired when I read an article about the recent passing of a beloved Massachusetts judge at the age of 94. 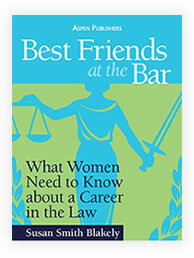 Positive role models are so important to career success, and they do not get much more positive than Judge Mary Muse. What a life! You will recall my last blog on women over fifty, well here is one woman over fifty who made every moment count and left an incredible legacy. Judge Muse had seven more children after graduating from law school — for the record, that totals eleven children — and seven of those children followed their mother (and father) into the legal profession. Her daughter said that “every one of us felt like we were the only one in her eyes when we needed her.” One look at Judge Mary Muse’s picture, and you can believe it. The loving kindness leaps out at you from the photo. She was 62 years old when she first was appointed to the bench, and she went to great lengths to encourage more women to become judges. According to one contributor to the obituary, she spent years instilling the confidence in women to realize what they had to contribute. A life like hers is hard to imagine. Most of us have two or three children today and consider it a lifetime achievement to combine that with a career. And it is. But, if there was a superwoman, who paved the way for all of us, it had to be Mary Muse. It does not diminish our own accomplishments to recognize that. It is important to note that Judge Mary Muse also had a strong female role model. Her mother was a physician when that was a rarity among women. Dr. Mary Moore Beatty was the first woman to serve as a school physician in Boston and the first woman appointed as a trustee at Boston City Hospital. Clearly, the apple did not fall far from the tree. “The other day I stumbled upon an article in Salon written by Tira Harpaz. The author’s pedigree was impeccable: a graduate of Juilliard, Princeton University and Fordham Law School, a mother of three, and a former attorney who now runs a college admissions guidance business. You would expect a woman of this stature to write from a place of empowerment, would you not? Instead, she penned a piece called “Women Over 50 Are Invisible.” Harpaz writes that anyone can be made to feel invisible if they’re put in “the shoes of an over-50 woman,” and goes on to recount copious scenarios that have made her feel value-less, beginning when a younger man on a train shot her a disinterested glance. Passersby would simply not see me when I walked down the street. People I met at parties would look slightly disappointed and then look past me, and gradually, I began to shrink inside. I asked myself why I don’t feel invisible, at 52. I’m a financially stressed single mother who lives in an apartment, works a full-time job, a part-time job, and writes a blog. And yet I don’t feel invisible. I feel like I can compete with younger women for male attention and am surprised when I walk into a room and a man doesn’t look at me. I never wonder what’s wrong with me; I wonder, what the hell’s wrong with him? Shrugging off society’s death knell to mature women takes audacity, something every 50-plus woman needs if she doesn’t want to go gently into that good night. Feeling invisible stems less from one’s appearance, and more from the value we put on other people’s often shallow judgments of middle-aged women. I think it’s my refusal to listen to the messages telling me I’ve passed my expiration date, and my determination to create a brilliant second act, that makes me seem younger than my years. So, there you have it. Hear, hear! I could not have said it better myself. There is a lot of life to be lived after 50 — I should know! Living it on your own terms is the key. 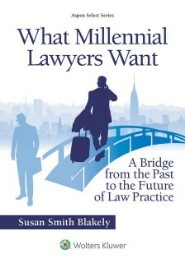 How long do you want to practice law — or reinvent yourself into another kind of practice or spin-off? I have done it so many times I cannot count them. 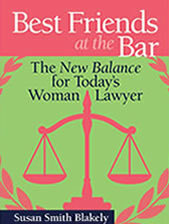 I went from teacher to military wife to lawyer to public servant to author/speaker and more in between. Each iteration of my life has been interesting and exciting and full of promise. It is what you make it. The bedrocks of confidence and attitude will assure aging with grace and aplomb and wide-eyed wonder! Cultivate them now so that it will be second nature to you when the time comes. And the time will come — yes, even to you. And you will be ready for it! Bonne chance. I hope you have the ride of your life.